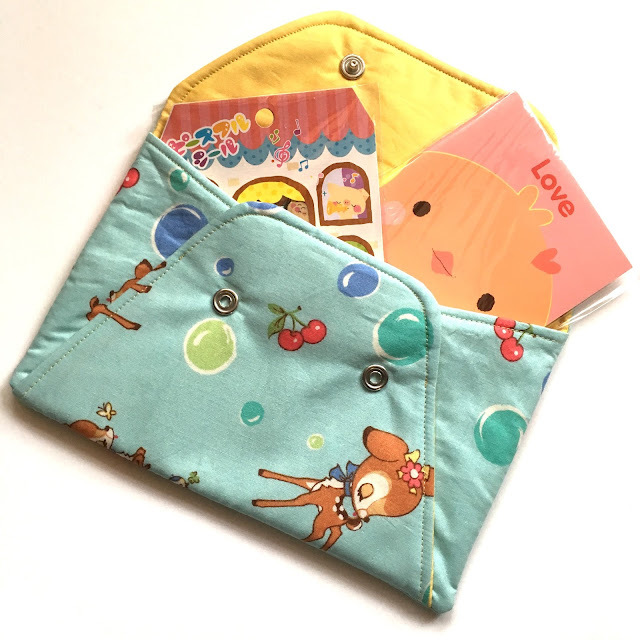 At the beginning of the week my daughter went to a birthday party and I wanted to make her friend one of these cute Secret Pocket Envelope Clutches by Michelle Patterns. I have made the pattern before and it's a fun project to sew. 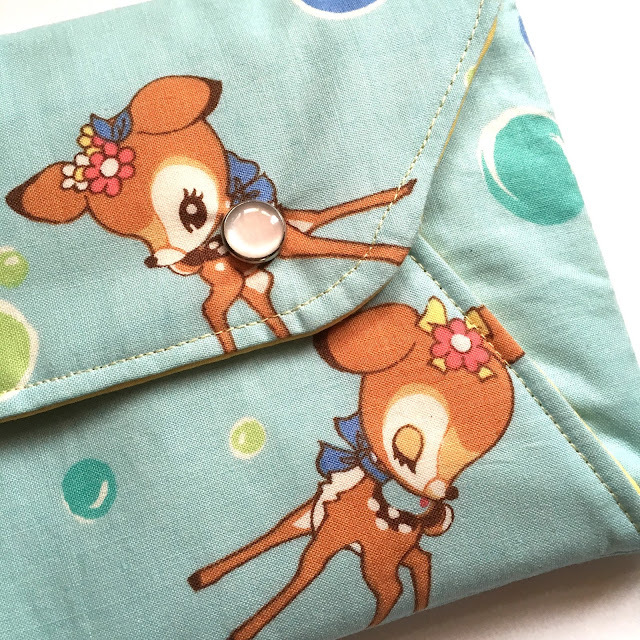 I used this sweet print, Deer and Cherries, 30's Collection by Atsuko Matsuyama, and the position of the deer worked fortuitously well! I also managed to finish my first blocks for this years Bee A Brit Stingy round robin and I'm really pleased with them. We are starting with a central hexagon, triangle and square, then every two months we make a triangle and square block for our bee mate based on their original. I was inspired by Jen Kingwell's book Quilt Lovely and used two of her patterns in the blocks. 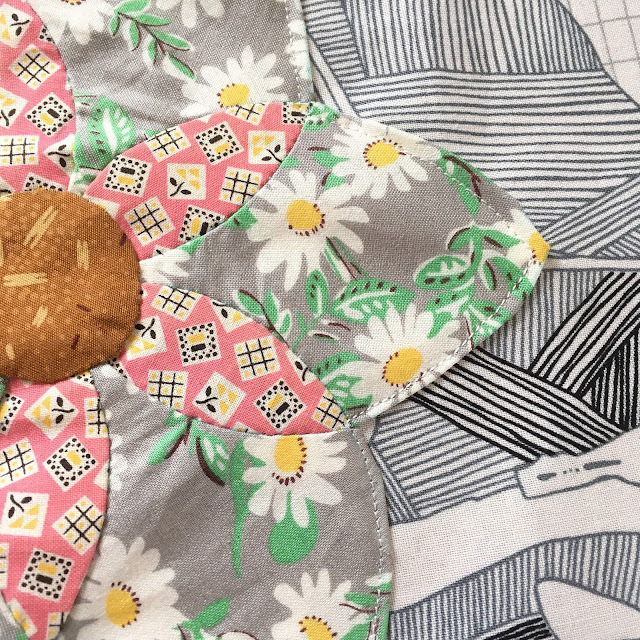 I hand pieced some 'Daisy Do' blocks and machine appliquéd them to six triangles that I had sewn into a hexagon. The square is a larger version of the 'Bonnie Lass' block. I chose triangles for the triangle after seeing Sheila's beautiful version. I hope she doesn't mind me copying! The background is The Big One in Pepper, Carkai by Carolyn Friedlander - which I got from Patchfinders. I think it makes it so striking without being too overpowering. This is going to be my 'Concrete Garden' quilt. I was too busy this week to get them sent off but they will be on their way at the start of next week. I'm really excited to work on all the other bees blocks this year! This was a bit of a mathematical challenge for me but I had help from the lovely Helen and Sheila to work it out. Thank you again friends! I love the concept of the concrete garden quilt! I've just started hand piecing the Daisy Do as well. 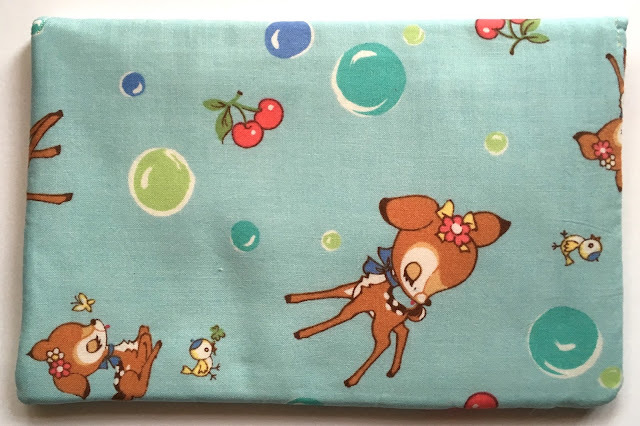 That Deer fabric is so cute! I'm curious to watch the progression of the round robin quilts. I love watching projects like this develop with the creative energies of each participant. Yours is already so cool! 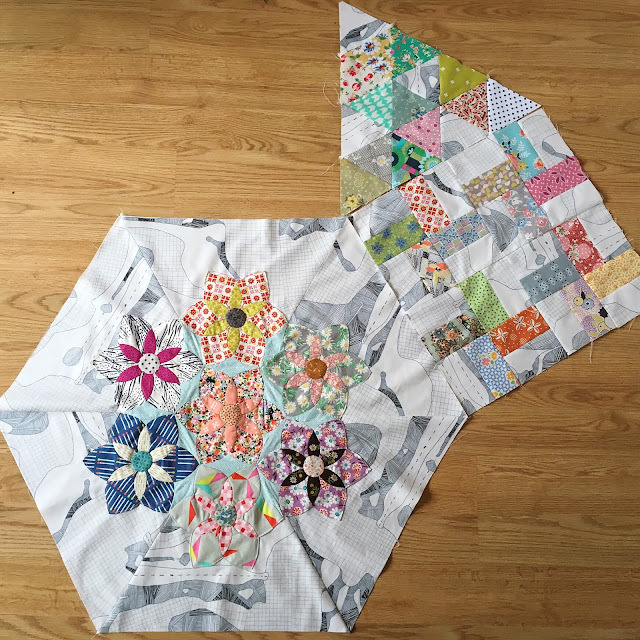 I love the start of your Stingy quilt and am looking forward to seeing what the others add to it! That round robin bee sounds like fun - I love where you started with yours! And that little clutch is so adorable!! i'm going to check out that pattern. The secret pocket is a cute idea! Filling it with things adds to the gift...it's no wonder she appreciates it. 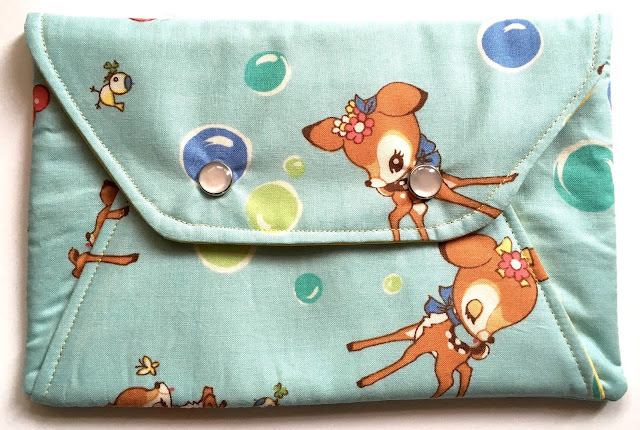 The deer fabric is cute. (I haven't seen it before.) The applique on the center hexagon really adds dimension. I'm interested to see how this turns out. Thanks for linking up to TGIFF. I love that envelope pouch! Congratulations on the finish and thank you for participating in the 2016FAL, on behalf of all the hosts!